A contentious embassy shift from Tel Aviv will not occur until a peace settlement is achieved. Australian Prime Minister Scott Morrison. THE PALESTINIAN LEADERSHIP has described Australia’s recognition of west Jerusalem as Israel’s capital as “irresponsible”, saying it violated international law. The country became one of just a few to follow US President Donald Trump’s lead and recognise the contested city as Israel’s capital. Australia said it would open a defence and trade office in the west of the holy city and Prime Minister Scott Morrison also committed to recognising a future state of Palestine with east Jerusalem as its capital. Both Israelis and Palestinians claim Jerusalem as their capital. Most foreign nations avoided moving embassies there to prevent inflaming peace talks on the city’s final status – until Trump unilaterally moved the US embassy there earlier this year. Senior Palestinian official Saeb Erekat said in a statement that the Australian decision to open a trade office in the city violated a United Nations resolution. “From the beginning, we’ve perceived the Australian government’s decision to recognise Jerusalem as Israel’s capital as one wherein petty domestic politics steer irresponsible policies that contradict world peace and security,” he said in a statement. “All of Jerusalem remains a final status issue for negotiations, while east Jerusalem, under international law, is an integral part of the occupied Palestinian territory,” he added. Morrison earlier Saturday announced his country’s move on Jerusalem. “Australia now recognises west Jerusalem — being the seat of the Knesset and many of the institutions of government — is the capital of Israel,” he said in Sydney. “We look forward to moving our embassy to west Jerusalem when practical, in support of and after final status of determination,” Morrison said, adding that work on a new site for the embassy was underway. 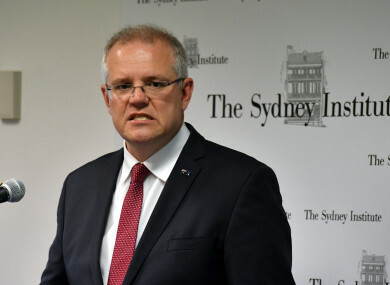 Morrison first floated a shift in foreign policy in October, which angered Australia’s immediate neighbour Indonesia – the world’s most populous Muslim nation. The issue has put a halt on years-long negotiations on a bilateral trade deal. Canberra on Friday told its citizens travelling to Indonesia to “exercise a high degree of caution”, warning of protests in the capital Jakarta and popular holiday hotspots, including Bali. Morrison pointed to Australia’s military history in the region, and the country’s interest in a “rules-based” order in the Middle East, to support the shift in foreign policy. The prime minister vowed Australia would no longer abstain from UN resolutions he said “attacked” Israel, but would instead oppose them, including the “Jerusalem” resolution, which asks nations not to locate diplomatic missions to the holy city. “The UN General Assembly is now the place where Israel is bullied and where anti-Semitism is cloaked in language about human rights,” Morrison said. The Jerusalem decision could help the embattled Australian PM - who faces the prospect of an election drubbing next year – with Jewish and conservative Christian voters and win him friends in the White House. The opposition Labor party slammed Morrison for putting “self-interest ahead of the national interest”. “Recognising West Jerusalem as Israel’s capital, while continuing to locate Australia’s embassy in Tel Aviv, is nothing more than a face saving exercise,” shadow minister for foreign affairs Penny Wong said in a statement. “This is a decision which is all risk and no gain,” she said, adding it puts Australia “out of step” with the international community. Trump’s decision to move the US embassy from Tel Aviv last May prompted tens of thousands of Palestinian protesters to approach the heavily-protected Israeli border. At least 62 Palestinians were killed by Israeli fire that day. Israeli Prime Minister Benjamin Netanyahu has previously hailed Morrison’s initiative. The Palestinian government will press for Arab and Muslim states to “withdraw their ambassadors” and take some “meat and wheat” style “economic boycott measures” over Canberra’s decision, Palestinian ambassador to Australia Izzat Abdulhadi told AFP Friday. The Australia Palestine Advocacy Network (APAN) on today said Morrison’s move “serves no Australian interest”. “This sabotages any real possibility for a future just agreement and further emboldens Israel to continue with its daily human rights violations of Palestinians,” APAN president Bishop George Browning said in a statement. Email “Palestinians slam Australia's move to recognise west Jerusalem as capital of Israel”. Feedback on “Palestinians slam Australia's move to recognise west Jerusalem as capital of Israel”.